British author who was also a teacher. Born in 1928. She wrote for both adults and children, but as far as I know only wrote these three pony books. Two of these form a short series set in Scotland, the other is a stand-alone story set in the racing world. 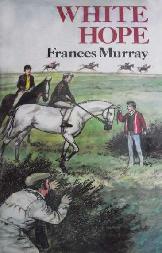 Reprinted in hardback as part of the Collins Pony Library series (number 17) in 1973. EDITIONS PICTURED: First edition, Collins Pony Library edition. SUMMARY: Pleasant, undemanding pony story set in Scotland. 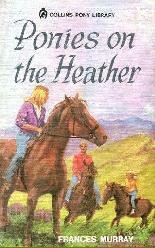 Jo is upset when she has to leave her home and friends when the family moves to Scotland. But once there she falls in love with the place, its animals and of course its ponies. 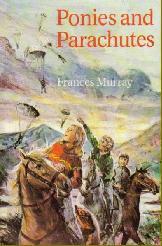 SUMMARY: Adventure and mystery beset Jo when an unwelcome visitor arrives from Canada and she also becomes mixed up with a parachute regiment and armed robbers! Less pony content than the first book in the series. These were not reprinted in paperback. 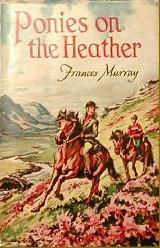 In the UK, Ponies on the Heather is much the easiest to find and was also reprinted as a hardback with pictorial boards as part of the Collins Pony Library series. The sequel is a lot harder to find but is not usually very expensive. Outside of the UK both are quite hard to track down. SUMMARY: Racing story. Young Chas has ambitions to follow in his grandfather's footsteps and become a famous jockey. Not a common title, but some copies are available in the UK and Australia. It seems to be especially hard to find in the USA.